The Peoples Democratic Party has accused the Governor of Imo state of selling about 71 vehicles as his tenure nears an end. 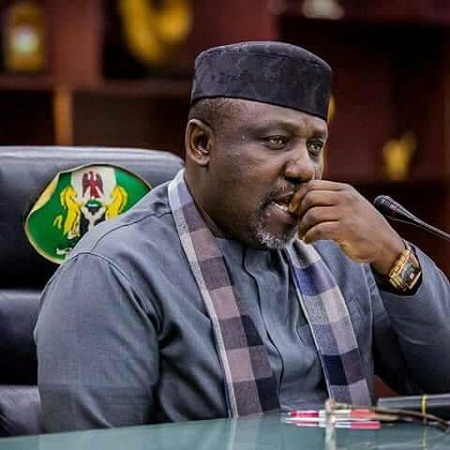 The Imo State chapter of the Peoples Democratic Party (PDP) has accused outgoing governor of the state, Rochas Okorocha of embarking on last minute pillaging of the state ahead of expiration of his tenure on 29th May 2019, NewTelegraph has reported. The party said that the state governor had, last week, disposed of 71 government vehicles, including Sport Utility Vehicles (SUVs) and heavy duty trucks to cronies at a ridiculous price of N6.1 million. A traditional ruler was alleged to have acted as auctioneer. The PDP had, last week, raised the alarm that the outgoing governor had engaged in the looting of the state, illegal employment, selling of government property and the issuance of Certificates of Occupancy to his cronies, family members and associates in a last-minute move to fleece the state. The state secretary of the party, Hon. Ray Emeana yesterday, at a press briefing, made copies of the memo for the auction of the 71 vehicles available to newsmen, noting that the party had earlier drawn the attention of Imo people to the on-going looting of the state government’s property by officials of the outgoing government. He said: “We are here to substantiate the allegation which we made last week that the outgoing Governor Rochas Okorocha has been selling off the properties of the state. “A circular from the Cabinet Office and signed by Mrs. Ukaigwe Julia, in which Governor Okorocha has approved the appointment of the traditional ruler of Amannachi, Dr. M. Osakwe as the Auctioneer for 71 government-owned vehicles, which includes Toyota Hilux, Prado Jeeps, heavy duty trucks, bitumen tankers, CAT payloaders, Toyota Camry, Toyota Corolla, Nissan Armada, Toyota Land Cruisers and others. Emeana also disclosed that the outgoing governor had embarked on illegal employment of people into the ministries without due process. “Governor Okorocha is ostensibly out to plant landmines and booby traps for his successor, Chief Emeka Ihedioha of the PDP. “This is a clear and deliberate attempt by Governor Okorocha to put the Emeka Ihedioha administration into serious difficulty. This is a landmine being planted by Okorocha. As we speak, the government is engaged in illegal employments backdating letters of employment. “We are, therefore, advising those who are buying these items including lands, to desist forthwith because they are not the personal properties of Governor Okorocha, but that of the state and these properties would be recovered,” PDP said. Reacting, the Secretary to the Imo State Government, Chief Mark Uchendu, dismissed the claims by the PDP as fallacious. “Their claims are untrue. Government did not auction any vehicle this year. The vehicles were auctioned last year after they were duly evaluated,” he said.